Home Sewing Sewing Machine Resources What Can I Make With a Sewing Machine? Sewing machines can look rather complicated and even a bit overwhelming with all the options they offer, but don’t let this scare you. Before you ask “What can I make with a sewing machine?” let’s review what to look for. 1 What Does a Sewing Machine Do? 5 What Can I Make With a Sewing Machine? What Does a Sewing Machine Do? Sewing machines are designed to make any sewing project go faster and easier. The basic definition is to sew together two materials with thread. Over the years upgrades have made them capable of doing everything from sewing on a button to stitching small embroidery designs into your stitches. 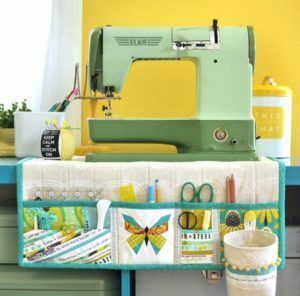 There are so many projects you can do with a sewing machine that it has become a common tool in today’s home. Almost all sewing machines come with the basic stitches. Your sewing machine will come with a guide telling you which symbol represents each stitch. These are two stitches that will be on every sewing machine because they are used most often. Straight Stitch – this is your basic straight stitch, and it is going to be one you use most of the time. It is exactly as it says a straight line in and out of the material. 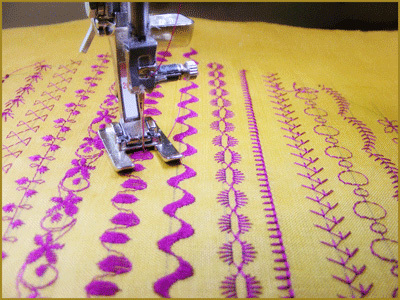 Zigzag Stitch – This one looks exactly as it is described and it is used to finish edges or help to prevent fraying of materials. There will inevitable me more stitches for you to choose from, you will see a variety of button hole stitches to locking stitches. Practice with the straight stitch and zigzag stitch first and once you are comfortable with those take a scrap piece of cloth and try out the others on your machine. They all have used and will help with all of your sewing projects. You are still wondering “What can I make with a sewing machine?”, we are almost there. The sewing machine pedal will start and stop your machine leaving your hands free leaving your hands free while sewing. Some machines are now built with arm or button pedals. The arm apparatus sticks out from the sewing machine and allows you to lean on it with your elbow as you guide the material. You start by pushing down and stop by letting up. This is usually a secondary option in addition to a regular foot pedal and is useful to anyone with foot or leg trouble. Some machines are also equipped with a start button you press to start and stop. Machines with all three options can be ideal if you are not sure about the space you will be sewing in. When you are working on a project with your sewing machine, it will involve a great deal of visual acuity. You will be watching the material and where it goes under the needle to keep stitches straight or to follow along a path you have predetermined. Your eyes will need all the help they can get. Electric sewing machines are mostly standard with one light source. Some models have two. When you are testing out the machine before you buy to be sure to turn on the light and see how bright it is and what it covers. A new electric sewing machine will come with at least two speeds. This allows you to go fast when you are comfortable with a stitch or line of stitch and to slow it down when you are going around a corner on a piece of material or using a stitch you are not yet comfortable with. A sewing machine with a sliding speed button will allow you to set the speed from slow to fast and everything in between. It works with your comfort level or project needs and opens up more options for sewing. Still wondering “What can I make with a sewing machine?” coming right up. A sewing machine is an essential tool at home in today’s world. You can make all types of repairs to clothing, bedding, furniture, and accessories. Sewing buttons onto pants or accessorizing your plain pillows with ribbon or rickrack and even sewing up holes in stuffed toys or throw pillows are just some of the repairs and upgrades you can make. Home decorating is easier with a sewing machine. You can make new curtains, a throw blanket or even a quilt for your bed. Sewing stuffed animals and dolls, aprons, clothes and one of a kind bags for family members and friends will make your holiday gifts stand out and have that homemade value that people strive for in their holiday purchases. A sewing machine will help make your house a home.